After being trapped in cryosleep for decades, Chell, the defiant lab rat of the original Portal game, once again finds herself inside Aperture Science and is woken up by an unfamiliar robot named Wheatley. He will help you escape before the Aperture Science building collapses. On your way out you’ll stumble upon your trusty portal gun which will help you escape the remains of many test chambers. Like the previous Portal, you can make inter-connecting portals that allow you to travel between rooms and floors easily. As you’re making your way out of the depths of Aperture Science you’ll be travelling through the beginnings of Aperture to modern day. The décor changes as you work your way through the labyrinth. There are offices with 70’s décor and main frames to the 80’s era with monochrome CRTs and desktop PCs. Along your travels you’ll get to know Cave Johnson, the President of Aperture Science, through his pre-recorded messages and test findings. The messages are pretty funny and make you wonder why people would willingly go through these “tests” for $60. The humor in this game is top notch and there’s a funny new credits song after you beat the single player campaign. The puzzles start off easy and get gradually harder. Many of the same concepts are in place where you have to put weighted cubes on buttons to open the exit doors. When it comes to placing portals, there are times when you'll have to free fall and place a portal on the ground to gain enough velocity to make it across a wide cavern. Some of the puzzles have multiple solutions but most can only be solved one way. Strong Points: Longer single player campaign; new multiplayer game play. Weak Points: You’ll be called fat and insulted throughout the game. Exploration is rewarded and there are some funny achievements that you can earn by discovering some artifacts. Both the single and multiplayer modes have achievements available. While you can explore, there is not much environment interaction and makes this game feel rather "dated". There are plenty of tests this time around. The original Portal game was fun but extremely short. That’s not the case in the sequel. The single player campaign took me twelve hours to beat. Once you beat the single player campaign you can check out the multiplayer and the free downloadable content. Some new additions to Portal 2 are the blue, white and orange goop. The blue goop makes the surface it’s on super bouncy and allows you to jump far and high. The orange goop makes the floors really fast giving you a burst of speed. There are many puzzles that will be utilizing these paints and combing those two will get you pretty far in life. Can’t place a portal? The white goop can fix that by making surfaces paintable or allow portals to be placed on it. Besides the new goop, there are light bridges and light beams that you can place to travel across deadly chasms of emptiness. There’s also a new kind of cube that redirects laser beams. While the laser beams are not deadly, they can be used to trigger and unlock various sensors. The multiplayer has some neat additions worth noting. If you can’t decide on who gets to do what you can settle it in an old fashioned game of rock, paper, scissors. Another helpful tool to communicate is the pointer. Steam natively supports voice communication and it definitely comes in handy here. The console versions of the game support split screen multiplayer. The Play Station 3 version can play against other steam players cross platform and save your progress on the steam cloud. Also, the PS3 version of the game includes a steam key to use with your PC. Sadly, Xbox 360 users only get to enjoy split screen multiplayer. The multiplayer tests are fun and challenging. The added game play time will vary depending on if you’re playing against an experienced player or not. It may be extended even further with more DLC add-ons (for pay or free). GLaDOS is back and she tends to favor one player over the other and her comments are rather humorous. As you play the game you can unlock items and customize your multiplayer robots with unique looks and apparel. The multiplayer has the same look and feel as the single player campaign. The player robots have expressions and seem to be more human than robot in nature. GLaDOS will call you a human as an insult. The environments are rather dreary and falling apart in most of the maps. While the graphics are good, the Source engine is starting to show its age. The physics are still top notch however. I love the voice acting of Wheatley, GLaDOS and Cave Johnson. They all sound so different and are all fun to listen to. You definitely don’t want to miss a word they say. My only complaint is that Mr. Johnson says the D word a couple of times and GLaDOS says hell in case that offends you. Other than that, the game is relatively family friendly. The only violence is from turrets, neurotoxins, and spiked walls that can smash you into a pancake. 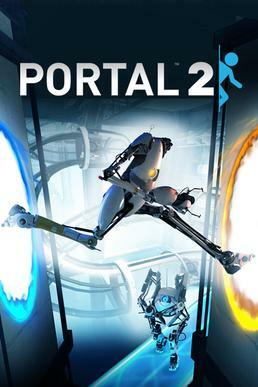 If you enjoyed the original Portal, getting the sequel is a no-brainer. I have enjoyed the single and multiplayer campaigns thoroughly and can’t recommend this game enough. Even though the tests are similar in nature to the original game, the character development is what makes this sequel truly stand out. While my kids enjoy the original Portal, I’m a little hesitant on loading this on their machines due to the mild language. My kids are 6 and under so I’ll hold off until they’re a little older. After all, it is rated E10+.